Goodreads says, "Peyton, Sydney's charismatic older brother, has always been the star of the family, receiving the lion's share of their parents' attention and—lately—concern. When Peyton's increasingly reckless behavior culminates in an accident, a drunk driving conviction, and a jail sentence, Sydney is cast adrift, searching for her place in the family and the world. When everyone else is so worried about Peyton, is she the only one concerned about the victim of the accident? Enter the Chathams, a warm, chaotic family who run a pizza parlor, play bluegrass on weekends, and pitch in to care for their mother, who has multiple sclerosis. Here Sydney experiences unquestioning acceptance. And here she meets Mac, gentle, watchful, and protective, who makes Sydney feel seen, really seen, for the first time. The uber-popular Sarah Dessen explores her signature themes of family, self-discovery, and change in her twelfth novel, sure to delight her legions of fans." Sydney has always been in the shadow of her charismatic and handsome brother Peyton, even when he started down a bad path of drugs and drinking. Her parents then focused all of their energy on "fixing" him and she fell further into the shadows. One fateful night, Peyton drinks and then gets behind the wheel. He hits a teen boy and the boy ends up paralyzed. Now Peyton finds himself in prison and Sydney's family is lamely trying to pick up the pieces. No one really wants to deal with the horrible reality, no one except for Peyton. Sydney decides she needs a chance to start fresh and leaves the prestigious private school she has attended for years and goes to a local public school. She is feeling like a fish out of water, that is until she stops by a local pizza shop and meets Layla and Mac Chatham. They accept her, regardless of her family's issues and sincerely want her friendship. She even befriends their mother, who is way more of a maternal figure than her own. Sydney even starts to have feelings for Mac who she feels like finally sees her and gets her, which is something she hasn't experienced in a long time. 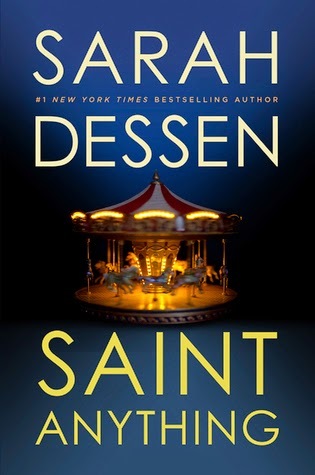 Sarah Dessen's Saint Anything is a bit darker than I was expecting. There's no Colby beach town or indulgent days spent sunbathing and galavanting on the beach, but there's something real here and something that will stay with readers much longer than expected. Sydney is someone I felt for immediately in Saint Anything. She is overshadowed by her brother and his problems. Her parents are in denial about the reality of Peyton's situation and really don't address it. This further complicates things for Sydney because she desperately needs to talk about what happened and feels guilty, in a sense, about the boy that Peyton hit with his car. Instead of talking about things and working through it as a family, her mother sort of switches on a "fix-it" mode where she micro-managages everything for Peyton, even though he is in prison and doesn't necessarily want her help. It was sad to see Sydney fall to the side when she desperately needed to be seen by her parents. Her parents didn't even notice when she was uncomfortable being left with "babysitter" Ames, her brother's friend, when her parents were out of town. I wanted to scream through the pages to get their attention, but Sydney suffered through all of her parents' missteps quietly. Once Sydney meets the Chatham family, she starts to come out of her shell in Saint Anything. Ultimately, they accept her. Even Mrs. Chatham lends a maternal ear and helps Sydney come to grips about her brother's accident. I loved the Chathams. Everything from their pizza parlor, their band, their love of bluegrass and even their issues with their challenging sister and their mother's multiple sclerosis....I loved it all. I thought Dessen did a brilliant job of portraying an imperfectly perfect family....one that is the polar opposite of Sydney's. The romance in Saint Anything is a slow burn and it fit the storyline well. I really enjoyed the character of Mac and learning more about him. He's a genuinely good guy and I was cheering for Sydney and Mac from the beginning, even if they had to tread lightly since Mac is Layla's sister. But Saint Anything is more than just a romance and a complex family drama; it's about self-discovery, which I loved. Sydney finds her voice and finally starts advocating for herself. She wants to be seen and respected by her parents, which is what most teenagers want. I adored her journey in Saint Anything and I think many teenagers can relate to Sydney's struggles. Even though this book is much darker than I expected (under-age drinking, DUI, sexual assault, etc. ), I still thoroughly enjoyed it. There were some fantastic one-liners in this book that only Dessen can write and about half way through it, I realized that no one gets families like Sarah Dessen. No one in young adult literature can truly paint a picture of a complex familial relationship and get to its core like she can. 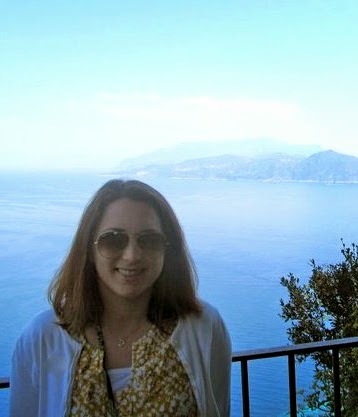 In the end, Saint Anything made me smile and I was left with hope. What more could you want? 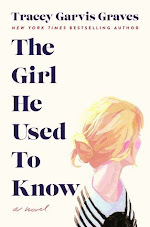 Summer isn't the same without a Sarah Dessen novel, so if you are fan, you won't be disappointed. Pick up a copy for your beach bag this summer. Christina, I definitely enjoy Sarah Dessen's novels and this one sounds like an interesting change; I'm going to have to read it! Thanks so much for such a great review; can't wait to see what you have up next for us! Have a great weekend! Very excited to read this one! I didn't love The Moon and More - but this one definitely sounds like a great read and maybe a little different from Dessen's usual summer favourites? It definitely is, Leanna. It's different, but in a good way. 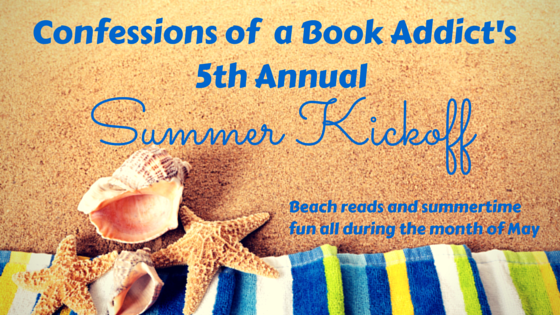 It's not one of her "beach reads" necessarily, but it has all the other things I love about a Dessen novel. I think you'll like it overall! Thanks for visiting! Yes, definitely darker, but I think more powerful and less fluff. I can't wait to hear your thoughts on it, Christina. Thanks for visiting!